Drag Light Bulb LD from the Document Stencil and drop an instance on the page. Link a data row to a shape. Select a row in the External Data window and drag to the shape. Figure 7 shows this in action. a. Leave the data-linked shape selected. b. On the Data tab in the Display Data group, expand the Data Graphics drop-down, and click the item under No Data Graphic. The lines and text disappear. c. Turn off the automatic application of Data Graphics when data linking. Revisit the Data Graphics drop-down and uncheck Apply after Linking Data to Shapes at the bottom of the list. In the External Data window, note the link icon next to the row that you just dragged. This indicates that one or more shapes in the drawing are linked to this row. Practice tracing links between data rows and shapes. a. 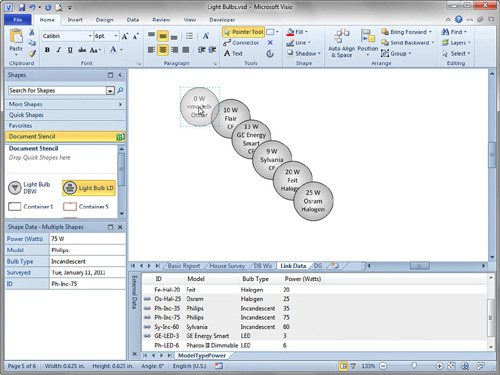 Create several copies of the data-linked light bulb shape. b. Deselect all shapes in the drawing. c. Right-click the linked row in the External Data window and then click Linked Shapes. You should see several entries. d. Click one of the subitems in the Linked Shapes menu. The corresponding shape is selected in the drawing window. a. Right-click one of the data-linked light bulbs in the drawing window. b. Choose Data, Unlink from Row. The shape is no longer linked. c. Right-click the row in the External Data window and click on Linked Shapes. The list should have one fewer item. d. Alternatively, you can right-click a linked row in the External Data window and choose Unlink. This breaks links to all shapes at once. Link multiple rows to multiple shapes. a. Select the Light Bulb LD master in the Document Stencil window. b. Hold down the Ctrl key and click on several rows in the External Data window so that multiple rows are highlighted. c. Drag the selected rows into the drawing window. An instance of the selected master is created for each row of data and linked to that row, as shown in Figure 8. Figure 8. Linking multiple rows to multiple shapes. Select a master first, select multiple rows of data second, and then drag and drop! When you use Link Data, Visio tries to map the column names in your data source to the Labels of your Shape Data fields. If it finds a match, the Shape Data is linked to the database record. If not, Visio adds a new Shape Data field to your shape when you link. This mapping is case sensitive. So if your Light Bulb shape has the Bulb Type field and your Excel sheet has a Bulb type column, no match would be found. Your shapes would end up with an extra (and unwanted!) Bulb type Shape Data field. Recall the earlier discussions about Shape Data row names like Prop.Row_1 and Prop.Row_2. With Link Data, you don’t have to worry about this, since data is mapped to Labels, not internal ShapeSheet row names. Clearly, using Link Data is much easier than using the Database Wizard. The picture gets even prettier when you throw in Data Graphics, discussed in the next section. Refresh the data— The Refresh All button provides some options for refreshing the data, when the external data changes. You can set the refresh to happen at specific time intervals, choose to overwrite changes to Shape Data with values from the data source, and be presented with refresh choices whenever the document is opened. Automatically link— If you have shapes that represent real-world objects, they might naturally have IDs that can be used to automatically pick up imported data using Auto Link. A classic example is a map of the United States. It makes sense to give each state shape a Shape Data field that holds the state’s name. Auto Link then can use this name to correctly map each shape to a record in a data set concerning states. The Automatically Link button leads you through a series of steps to properly match an identifying Shape Data field with a key in the data. Use additional data— You can import more than one data source using Link Data to Shapes. Each source shows on its own tab in the External Data window.